Charles denounces British and Indian depredations on the American frontier during the War of 1812, alluding specifically to the practice of offering bounties for American scalps. The cartoon may have been prompted by the August 1812 massacre at Chicago and the purchase of American scalps there by British Colonel Proctor. On the left a British officer receives a bloody scalp from an Indian, who has a purse with "Reward for Sixteen Scalps" hanging from his flintlock. The Indian's knife and tomahawk bear the initials "GR" (for Georgius Rex, i.e., King George). The officer says, "Bring me the Scalps and the King our master will reward you." From a button on the officer's coat hangs a tag or sack labeled "Secret Service Money." 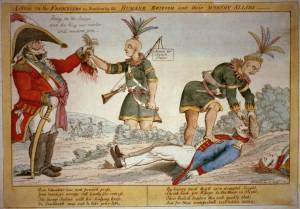 At right, another Indian is in the process of scalping a fallen soldier; another dead, scalped soldier lies nearby. In the background two Indians and two soldiers dance about a campfire. And for those wrongs shall restitution make."